Everton and Liverpool fought out a Merseyside derby at Goodison Park in what proved to be Brendan Rodgers's final game in charge of Liverpool. Danny Ings escaped Ross Barkley to head James Milner's corner past a static Everton keeper Tim Howard, but the game's outstanding performer Romelu Lukaku pounced on Emre Can's poor clearance to level just before half-time. Liverpool goalkeeper Simon Mignolet kept his team in contention, before Ings scored, with two magnificent saves from Steven Naismith and James McCarthy. Everton looked the stronger and more likely winners as the game progressed, and Rodgers was sacked an hour after full-time. Rodgers will have known this had the potential to be a defining game in a managerial tenure that was coming under intense examination. With Jurgen Klopp, Carlo Ancelotti and Frank de Boer heavily linked with Anfield, Rodgers knew defeat in such a high-profile fixture against their neighbours was not an option. It turned out that a draw was not enough. He may have even hoped for victory when Ings scored, but Everton deserved their point and arguably more besides, led by the rampaging Lukaku. It was not a result or performance that could clear the clouds hanging over Rodgers. Liverpool owners Fenway Sports Group acted fast and now have the international break to choose their new man. As Chelsea plunge into crisis and down to 16th place in the Premier League after the loss to Southampton at Stamford Bridge, some of their supporters may just have an envious glance towards the performance of Lukaku. Chelsea raked in a handsome £28m when they sold Lukaku to Everton in the summer of 2014, but he looked worth every penny once more as he terrorised the Liverpool defence. Lukaku left defenders Martin Skrtel and Mamadou Sakho living on their nerves as he dominated the aerial and physical challenges, scoring a deserved goal and leading Everton's attack. The only problem he had was a lack of support in and around when he was winning those headers and some very mixed service - but he looked the real deal. Lukaku's career has, so far, been something of a tale of unfulfilled promise but at 22 he has all the weapons to develop into a world-class striker. He is now adding goals, with one here on top of his match-winning double at West Brom on Monday. 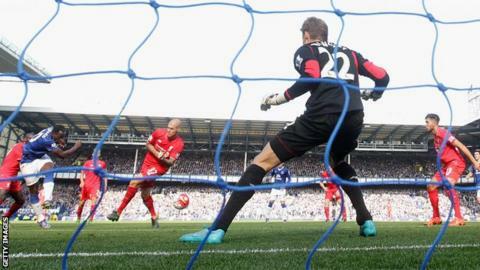 Rodgers and Everton counterpart Roberto Martinez will both be desolate about the defending that led to both goals. Ross Barkley lost Ings and Howard was nailed to his line as the former Burnley striker headed in James Miner's corner from five yards while Can's lashed, panicky clearance struck his own team-mate - Skrtel - before bouncing invitingly for Lukaku. Everton fielded an unfamiliar back four with John Stones and Seamus Coleman out injured and three making their first Merseyside derby starts in Brendan Galloway, Tylas Browning and £9.5m Ramiro Funes Mori. Galloway continued, as he has done all season, to look a class act in an unfamiliar left-back role, while Funes Mori improved as the game went on alongside the immaculate Phil Jagielka, making a couple of crucial interceptions. Everton manager Roberto Martinez: "Phil Jagielka, in my opinion, has been the best centre-half in the Premier League for the last 12 months and his relationship with the young Ramiro Funes Mori was outstanding. "Tylas Browning and Brendan Galloway and our whole back four were outstanding, martialled by keeper Tim Howard. The senior players led very well." Liverpool boss Brendan Rodgers: "Our mentality in the game was outstanding, the draw was the least we deserved. "I have got the passion, the players have got the passion and it never waned. What is forgotten is we lost four catalysts from team and that is huge. It is a constant rebuilding - this season is about that as well." Everton have now gone 10 league games without a victory against Liverpool. The last time they had a longer run was in 1984 (11). Liverpool have won just one of their last nine away Premier League games (D4 L4). The last four results between Everton and Liverpool at Goodison have been 2-2, 3-3, 0-0 and 1-1. Five of Liverpool's last six games in all competitions have ended 1-1. The Reds have failed to keep a clean sheet in their last eight games in all competitions. Bolton manager Neil Lennon speaking on BBC Radio 5 live: "Liverpool were the better team in the first half. On balance a draw is a fair result. "Their second-half performance was not great but they defended well and limited Everton to few chances." Everton host Manchester United in their next game after the international break on Saturday, 17 October, while on the same day Liverpool have a trip to White Hart Lane to face Tottenham. Match ends, Everton 1, Liverpool 1. Second Half ends, Everton 1, Liverpool 1. Attempt blocked. Romelu Lukaku (Everton) left footed shot from outside the box is blocked. Assisted by Tyias Browning. Mamadou Sakho (Liverpool) is shown the yellow card. Romelu Lukaku (Everton) is shown the yellow card. Attempt blocked. Romelu Lukaku (Everton) left footed shot from the left side of the box is blocked. Corner, Liverpool. Conceded by Brendan Galloway. Arouna Koné (Everton) wins a free kick in the defensive half. Attempt blocked. Philippe Coutinho (Liverpool) right footed shot from the centre of the box is blocked. Assisted by James Milner. Corner, Liverpool. Conceded by Tyias Browning. Substitution, Liverpool. Joe Allen replaces Lucas Leiva. Attempt missed. James Milner (Liverpool) header from the centre of the box is high and wide to the right. Assisted by Alberto Moreno with a cross. Substitution, Liverpool. Adam Lallana replaces Danny Ings. Delay in match James McCarthy (Everton) because of an injury. Foul by Nathaniel Clyne (Liverpool). Attempt saved. Philippe Coutinho (Liverpool) right footed shot from the centre of the box is saved in the top centre of the goal. Assisted by Lucas Leiva. Lucas Leiva (Liverpool) wins a free kick in the attacking half. Attempt saved. Romelu Lukaku (Everton) right footed shot from the right side of the box is saved in the top centre of the goal. Assisted by Aaron Lennon. Attempt blocked. Ramiro Funes Mori (Everton) left footed shot from more than 35 yards is blocked. Assisted by Gareth Barry. Brendan Galloway (Everton) wins a free kick on the left wing. Lucas Leiva (Liverpool) is shown the yellow card for a bad foul. Read more on Will under-pressure Premier League managers be given time?